We invite you to our Marriage Conference on March 22nd & 23rd. We would be thrilled to have you join us and many other couples from throughout the Black Hills. We have been praying that you and your spouse will be rejuvenated and re-energized during this special retreat time. This conference has been planned with your marriage in mind. Our Marriage Weekend promises something for every couple, whether you’re newlyweds or have been married for decades, whether you’re completely in love or have fallen out of love, or whether you are totally secure in your marriage or barely hanging on. 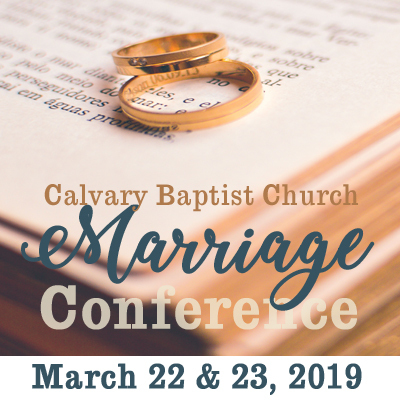 Inspirational and seasoned guest speakers, Toby & Sonia Jenkins, from Henryville, Indiana, will help you find the encouragement, inspiration, hope, excitement, renewed health, and most importantly, the biblical perspective you need to thrive in your marriage. So don’t settle for being “just married.” Instead, pray for and invest your heart, soul, and mind into your most important earthly relationship. Give your heart to this weekend. In doing so, we believe you’ll leave inspired and equipped to live as couples who picture the beauty of the gospel in your marriage. Print the brochure below or grab one from our church foyer. Deadline to register is Mon, March 11th.